The story of the murder of Ben-Hadad is a troubling text. All the way back in 1 Kings 19, God told Elijah that Hazael would become the King of Aram and exercise the Lord’s judgment on the house of Ahab. Ten chapters later, Elijah’s apprentice, Elisha finally meets Hazael, but what he sees causes him to weep. Fire burning, men dead, children crushed, and women violated and eviscerated. This will be the legacy of Hazael. Even knowing that Hazael will be part of the judgment on Ahab, even knowing the unfaithfulness of Israel and its king, the brutality forces the prophet to weep. 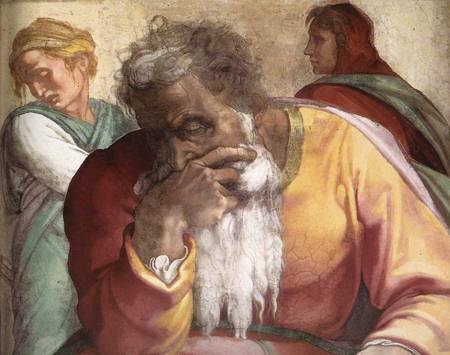 Elisha will not be the last of God’s prophets to weep for the people he loves. Nor will he be the last to prophesy judgment on a people who have wandered from God and wish it were not so. Jeremiah, Isaiah, even Jesus himself are known to weep over Jerusalem. Elisha weeps for what Hazael will do to his people. For what do we weep today? I fear our culture has forgotten how to weep with the prophets. We know how to be angry and outraged. We know how to wave our flags, champion our causes, and attempt to cut down our enemies with words. We know how to desensitize ourselves and ignore pain and suffering. We know what it feels like to be tired and shut down after days and days of sin, destruction, and brokenness upon television and computer screens. Do we know how to weep anymore? Can we look with fixed gaze upon the face of Hazael and weep? Can we weep for what we see of Hazael in ourselves? Can we weep for what we see of the fruit of Hazael in our culture? Can we weep for the churches burned, the young men dead, children cut into pieces and sold after being torn from mother’s wombs? Can we weep today? The story of the murder of Ben-Hadad is troubling, not only for the treachery and brutality of Hazael and his twisting of God’s word for his justification. But it is troubling because we see the same things happening today as Elisha saw in the face of Hazael, and at least he was able to weep.